We rented this movie last night and we really enjoyed it. Robert Harris is a wonderful author who has a knack for writing about cold war and espionage and things related to it. His book Father land and the book Enigma were both turned into entertaining films. 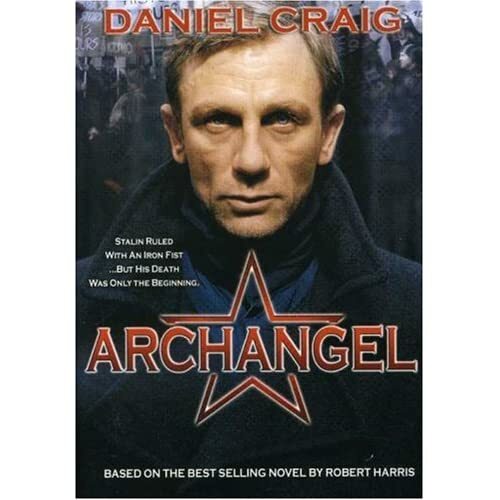 In Archangel Craig stars as a Historian who is an expert on Stalin. While in Russia lecturing he stumbles across information that may lead him to what might be Stalin’s lost diaries. Stalin being responsible for possibly more deaths than anyone, this could be big news. As these films often do, this one involves a plot that sees our historian friend hunting for the diary, and being thwarted. He hooks up with a Russian woman with ties to the story and a reporter who insists on coming along. The climax of the film is wonderful and the acting was great. I also really liked the locations and the way it was filmed. It even stayed pretty true to the book. I would suggest this film to people who enjoy spy movies, or just a good political mystery. Just fished this out of the bargain bin at Walmart. Love anything semi intelligent that was really set in Russia. From the half hour I have watched so far, it seems good. Glad it wasn't some stupid over produced over scripted Hollywood job.